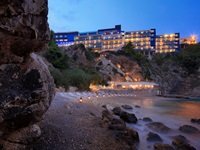 Hotel Excelsior Dubrovnik is among the finest hotels in the region. 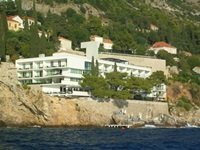 It is situated just a short 5 minute walk from Dubrovnik's Old Town and all its attractions. This 5-star hotel has all the comforts and amenities you expect from luxury hotel. It offers the finest service, private beach, both local and international cuisine and pampering spa & wellness centre. Hotel Excelsior features 141 luxurious guest rooms ranging from Classic to Deluxe, with a choice of single, twin or double occupancy. Each of 17 suites has a bedroom, living room, en-suite bathroom with power shower, separate toilet and sea-view balcony. Guests can choose from the Executive suites, the Ambassador suite and Presidential suite. Room amenities include flat-screen satellite TV with internet access, en-suite bathroom with power shower, bathrobes and slippers, exclusive luxuty L'Occitane toiletries, mini bar, direct-dial telephone, air-conditioning, safety deposit box, pay-per-view TV channels, turn-down service, laundry service, dry-cleaning service and free WI-Fi. At the Excelsior, three restaurants await you with their secret aromas, scents and tastes of authentic local, national and international cuisine. Prora Beach Restaurant is situated directly beside the sea, with the most spectacular view of the island of Lokrum and the Old Town. It offers light salads, appetizers, fresh seafood and meat and is ideal for romantic summer nights. Restaurant Salin offers a prime location for distinctive events (welcome drinks, wedding and meeting dinners). Satu Sushi Bar brings the exotic taste of Japan to Dubrovnik, in a spectacular setting overlooking the Adriatic sea. The Palm Terrace is the prime location for any outdoor special event, from weddings to fancy parties. Offering breathtaking views of the sea and Old Town walls, this unique location is a favorite spot for watching the opening of Dubrovnik Summer Festival and its' legendary fireworks. Abakus Piano Bar in one of the most famous and the most visited bars in Dubrovnik. From here you can enjoy a beautiful view of the Old town. It is a perfect place to relax, or get together while having a rich variety of drinks and light meals available. Hotel Excelsior has a private beach which is really a smooth stone quay, allowing you to be in the sea within two moves from your sun lounger. This area is reached via a tunnel and step ladders allow entry to the sea. The most popular city beach, Banje beach, is located just a few minutes walk from the hotel. There is an indoor heated swimming pool in the hotel. If you are staying in the hotel with your family and children, there is also children’s indoor pool. Spa & Wellness centre (Energy Clinic) at Hotel Excelsior is made up of treatment rooms, relaxation zones with heated deckchairs, an infinity pool, a fitness club, a Turkish bath, a Roman bath and a Finnish sauna, and two Jacuzzi whirlpools. They have three treatment rooms, a VIP treatment room with Jacuzzi and a VIP treatment room for two with a Jacuzzi, plus theme showers that can be set to hot or cold, depending on your preference. The Fitness Club, which is located next to the pool, is fitted with the latest cardio and strength equipment. Use of the pool, Jacuzzi whirlpools and fitness area is free of charge for guests. 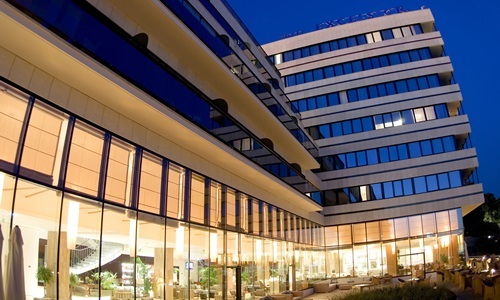 Hotel Excelsior, known as one of the finest and the most luxurious hotels in Croatia, provides professional services, the most advanced equipment and assistance for conferences, international congresses, incentive meetings and other business events. It has six multifunctional conference rooms ranging from 15 to 650 participants. At the hotel reception guests can book all kind of city tours and excursions (history and heritage tours, sailing and island hopping tours, food & wine tours, adventure jeep safaris, excursions to Montenegro & Bosnia and Herzegovina), rent a private boat or arrange a luxury transfer service.